BEIJING (AP) — Global stocks rose Friday as a record high on Wall Street buoyed investor sentiment despite global trade tensions. KEEPING SCORE: In Europe, London’s FTSE 100 index rose 0.9 percent to 7,433. Germany’s DAX gained 0.4 percent to 12,378 and France’s CAC 40 advanced 0.7 percent to 5,487. On Wall Street, futures for the Dow Jones industrial average and the Standard & Poor’s 500 index were both flat. ASIA’S DAY: The Shanghai Composite Index rose 2.5 percent to 2,797.48 and Tokyo’s Nikkei 225 advanced 0.8 percent to 23,869.93. 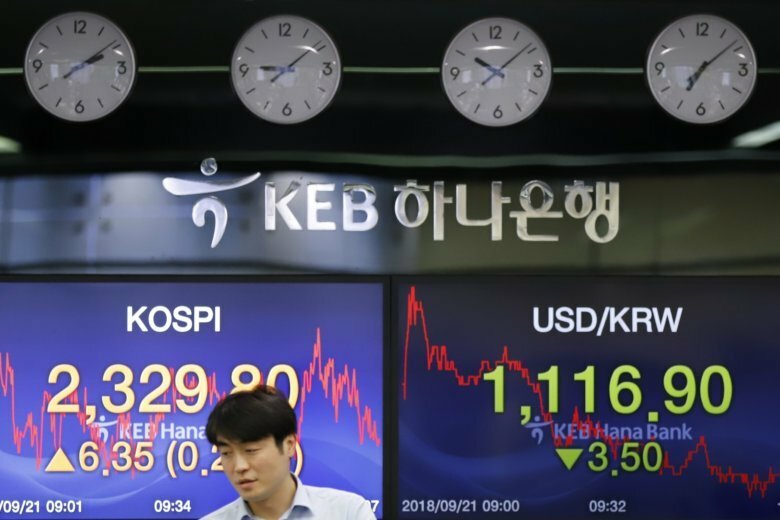 Hong Kong’s Hang Seng gained 1.7 percent to 27,869.93 and Seoul’s Kospi was up 0.7 percent at 2,339.17. Sydney’s S&P-ASX 200 added 0.4 percent to 6,194.60 while India’s Sensex shed 1.6 percent to 36,512.26. Benchmarks in New Zealand, Taiwan and Southeast Asia also advanced. TRADE TENSIONS: The Dow and S&P 500 set records as a wave of buying pushed prices higher despite an escalating trade war between the U.S. and China. The latest U.S. tariff hike on Chinese goods in a dispute over Beijing’s technology policy takes effect Monday, when Washington imposes an additional 10 percent tax on $200 billion of imports. The tariffs will rise to 25 percent on Jan 1. Beijing announced it would retaliate by imposing tariffs of 5 or 10 percent on $60 billion of U.S. goods including coffee, honey and industrial chemicals. MANUFACTURING: A preliminary version of Japan’s monthly purchasing managers’ index showed factory activity accelerated in September. The measure of new export orders rose to a four-month high. A similar gauge of manufacturing in the eurozone showed mixed signals, with services doing well but manufacturing weakening slightly amid the global trade worries. ENERGY: Benchmark U.S. crude fell 35 cents to $70.77 per barrel in electronic trading on the New York Mercantile Exchange. The contract lost 55 cents on Thursday to close at $70.32. Brent crude, used to price international oils, advanced 85 cent to $79.55 per barrel in London. It tumbled 70 cents the previous session to $78.22. CURRENCY: The dollar gained to 112.66 yen from Thursday’s 112.46 yen. The euro edged down to $1.1769 from $1.1778.